The Lausanne congress of 1974 marked the widespread adoption of integral mission as essential to the evangelical witness of Christ in our world. Ever since there has been ongoing debate as to the roles of evangelism and social action. 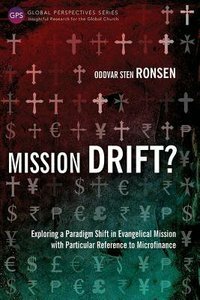 In this book Oddvar Sten Ronsen argues that instead of the priority of evangelism over social action there should be the anticipation of evangelism as a result of social action. Although evangelism and social action may not occur at the same time, the author warns of the possibility of "mission drift," where projects begin with the intention of meeting the social and spiritual needs of the people, but fail to proceed to evangelism. In succumbing to this mission drift, projects cease to be true to the principles of integral mission. Combining theological reflection with case studies of microfinance enterprises in the Philippines and Thailand, Ronsen evaluates the sustainability of, and social good delivered by, these Christian projects to the communities they serve. The research sheds light on the causes of a drift from integral mission, how these can be managed and whether microfinance can be a bridge for the gospel. About "Mission Drift? : Exploring a Paradigm Shift in Evangelical Mission With Particular Reference to Microfinance (Global Perspectives Series)"